Scotland captain Greig Laidlaw does not mind Eddie Jones discussing Calcutta Cup favourites because it may distract England and their new coach. After insisting Scotland were "red-hot favourites" to win at Murrayfield on Saturday, Jones has now changed tack. He joked that he would apologise to Scotland coach Vern Cotter and is happy for his side to assume that mantle. "The more talking he does about us, hopefully the less he's concentrating on England," said Laidlaw. Laidlaw, who will win his 47th cap in the Six Nations opener, the same tally as his uncle Roy Laidlaw, was nonplussed about who should be considered favourites. "You'll have to phone the bookmakers," he said. "I'm not a betting man. We just have to control the controllables. We will roll up our sleeves and we'll certainly be giving it our best shot. "We'll go out there with confidence. We have to. We want to turn Murrayfield into a place that is extremely hard for visiting teams to come. "We need to move on from the World Cup now. We've under-performed in the Six Nations in the past but no-one other than ourselves is going to give us a helping hand. "We need to grab the opportunity. It's going to be a tough game. England have good players and a strong set-up but we know the task ahead." Scotland have not beaten England in their last eight attempts since 2008, with one draw in 2010. They have only won their first game of the Six Nations once, in 2006, and have not scored a try against England at Murrayfield since 2004. 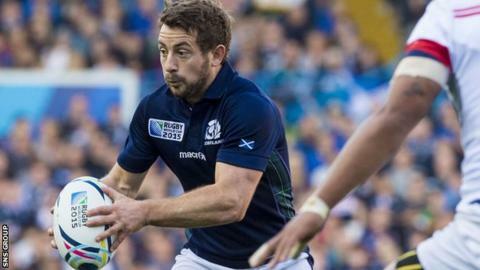 But Laidlaw, who was buoyed by watching Scotland's World Cup quarter-final performance against Australia back for the first time on Monday evening, says the Scots are "totally fixed" on consigning those statistics to history. "Clearly Scotland have under-performed in the tournament in the past but us as a team, this is our time in the jersey. If we can be the team who turned that around, that would be a great legacy for us to leave for the next group. "The Six Nations is a momentum-based tournament so if you can win early it gives you confidence. Winning your home games is also extremely important. History shows a defeat in the first game is not good, so it's a big game this weekend. We understand that. "Watching the Australia game for the first time in full, I got excited. I was able to take the emotion away from it and crikey, we played some good rugby. It gave me a great feeling. "The anger will never disappear but we can use it in the right way. I got a lot out of it. We played well but we could have played even better."